NO CHILD SHOULD GROW UP HUNGRY IN AMERICA. But 1 in 6 children struggles with hunger. Share Our Strength's No Kid Hungry campaign is ending childhood hunger in America by connecting kids in need with nutritious food and teaching families how to cook healthy, affordable meals. You can help surround kids with healthy food where they live, learn and play. Share Our Strength is a registered 501(c)(3) private, nonprofit organization. All donations are tax-deductible to the fullest extent of the law. 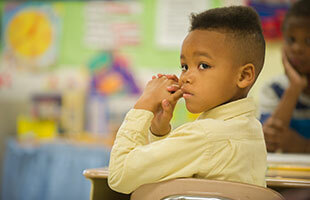 Hunger Hurts Kids in the U.S. Your tax-deductible donation will help us provide vulnerable kids in America with nutritious meals, so they can focus on being kids — not being hungry. For just $10, you can connect a child with up to 100 meals. Yes, please repeat this gift every month. If you donate and have not already registered, you will receive periodic updates and communications from Share Our Strength.